A Friday evening on a holiday weekend, a ferry boat on the bay, couples cozy, and the melodious sounds of Clairdee made for a perfect evening. 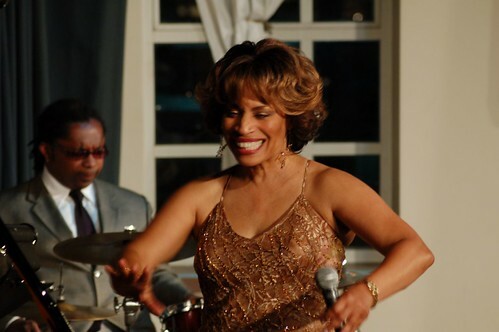 Clairdee recently performed the inaugural jazz concert for FerryMusic on the Santa Rosa Ferry Boat at Pier 3 on Embarcadero in San Francisco. FerryMusic is brand new venue in San Francisco for jazz, classical, and chamber music on a beautifully renovated ferry boat. Clairdee looked and sounded magnificent. She has a way of taking any song, whether new or old, and making it all her own. From Gershwin to Aretha Franklin to Sinatra, she does it all with such style and grace. She sizzled on “Summertime”, “Blue Moon”, “All The Way”, “Do What You Did Before”, and “This Is Love.” She even included four gems from the Shirley Horn songbook – “New York on Sunday”, “Get Rid of Monday”, “Don’t Be on the Outside”, and “The Great City.” She sang a soulful rendition of “Gonna Wait ‘Til the Midnight Hour” in tribute to Wilson Pickett and soulfully signified on “Someone Else is Steppin’ In.” Clairdee closed this magical evening with a rousing version of “Dr. Feelgood” that took us up high, down low, and all the way to church. She was accompanied by Ken French, Ron Belcher, and Deszon Claiborne. They kept the groove jumping all evening long. Please be sure to checkout future concerts at FerryMusic. For more photos from Clairdee concert at FerryMusic, click here. There is also an excellent article on Clairdee and FerryMusic in the SF Chronicle. I got photo credit for the concert photo of Clairdee….YAY!!!! This entry was posted on Thursday, June 15th, 2006 at 10:43 pm. It is filed under Concert Reviews and tagged with Clairdee, Deszon Claiborne, FerryMusic, Ken French, Ron Belcher, San Francisco. You can follow any responses to this entry through the RSS 2.0 feed.